For many social media curators the impending end of free and open Storify, used extensively to create stories in the form of collections of tweets and other social media clips, was a huge blow. These stories saved and shared as one URL have provided numerous educators and their students and opportunity to save information collected in one space. I’ve previously blogged about ‘Making and telling a good story with Storify‘. However Storify is moving to a pay only option aimed at corporates with a BIG budget…. Exit educators and students who have no budget. This post aims to both introduce the brilliant curation tool Wakelet and provide a basic guide to getting started. An added bonus is that Wakelet has created a function that allows you to import existing stories created in Storify. The web is filled with disconnected pieces of information and it’s growing all the time. Even the most specific terms bring up thousands or even millions of results that include articles, videos, blogs, tweets, Facebook posts, documents and websites. In real time social media streams, perfectly good content gets buried in no time at all. We encounter this daily, in both our personal and professional lives, and we wanted to do something about it – augmenting, not replacing search engines and social sites to add context. In short this application enables users to curate a variety of content to form collections or stories, with the added bonus of adding text to provide further context. From the home page you need to click on ‘new collection/story’. Give your collection a title and then add a description. Click save. Click on the icon and simply add your chosen content. To reorder tweets you simply toggle on and off the ‘easy reorder mode’ button and drag the content into the order you desire. Remember to save your collection as you go along. You can return to the story and edit. Finally make sure you make your post public and publish. (The post visibility is set to private as default). Then share the URL with your network. Create a new Wakelet and give it a title. Then save. Go to the green ‘Edit collection/story’ button (bottom right). Click the Twitter Import button that appears to search for Tweets to add to your collection. Add your chosen hashtag and then select all 50 tweets. Drag the cursor down. You can then choose to select all 100 tweets (and repeat until you capture all required). You have the option of then checking the box ‘add in reverse order’ to display the oldest tweets first. Save as you go along. Add extra detail to expand your story using text, images and links. 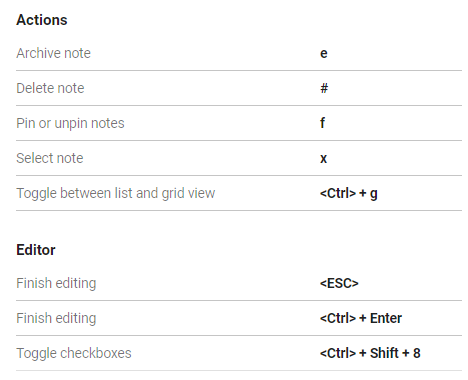 Edit options include reordering, adding extra information and deleting unwanted elements. 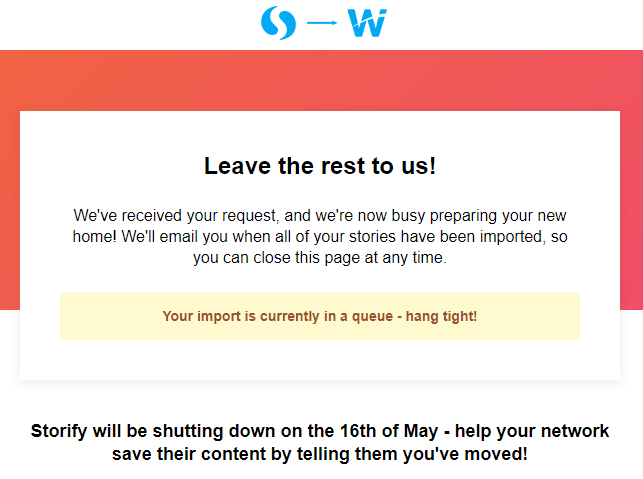 Wakelet has developed a simple to use process to import published stories already created in Storify (which will end access on May 18 and delete all collections). From the home page you need to click on the ‘import from storify’ box. You will then be prompted to enter your Storify username. Choose to select the stories you’d like to import and click ‘Begin Import’ or select ‘Import All’. You will then see this message. Look out for an email confirming the import is complete! Job done – AMAZING! 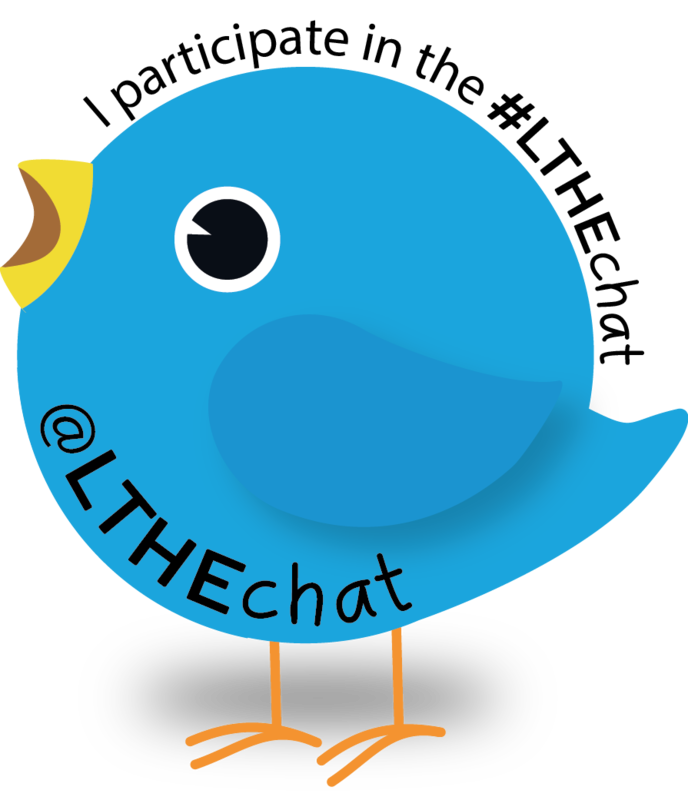 Below are a couple of examples of Wakelet accounts – my own personal account and the LTHEchat (Learning and Teaching in Higher Education chat). From time to time the unexpected happens and it is not possible for staff or students to get into university. This might be through illness, travel issues or as we are currently experiencing adverse weather. Over the last week the #beastfromtheeast hit the UK and snow has disrupted travel across the country, meaning many staff and students commuting to university by train or bus have been unable to get to classes or meet with peers for group work. The SMASH team (Social Media for Academic Studies at Hallam) were scheduled to get together for a planning meeting. 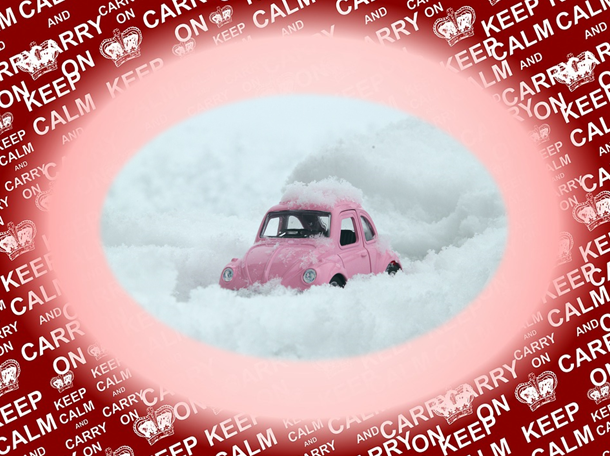 Knowing the weather forecast was predicting even more snow and one member had already started going down with a bad cold; it was decided that rather than postpone the meeting, the group would hold an online meeting. This in itself led to a conversation about what space to use and what was required. It seemed a good a idea to share this as a blog post with some tips on getting started. Here is the guest blog post led by Corran Wood, Abby Butler, Matty Trueman and Callum Rooney, students at Sheffield Hallam University from the Department of Computing. An online gathering can be a text based conversation or also include audio and video by sharing your devices microphone and webcam. In some cases there can be echoing when using audio and to overcome this it is useful to use a headset. Some laptops now come with a built in webcam or you can use a clip on version. If using a smartphone or tablet, both are built in. The person leading the online session will need to invite others to the group conversation. In most cases they will need to know the username and in some cases the email address used for this space for each person. (Having the email option is useful to pinpoint individuals where there are others with the same name). There are a variety of free tools accessible via the desktop or as an app, as well as tools that can be deployed within a Virtual Learning Environment (VLE) hosted by your organisation. Below you will find a selection that can be used to create a Tutor-led or Student-led online session or group discussion. Blackboard Collaborate is a simple, convenient, and reliable online collaborative learning tool that provides a virtual classroom experience. It allows tutors to engage with students by creating video conference calls, online meetings, file sharing and discussions. Moreover, the ability to collaborate and make real time annotations on documents with the addition of emojis makes this tool a student and tutor friendly application. The maximum number of participants for a session is 25 with up to 400 users in a chat. If it is the first you have used Collaborate you may have to download the Blackboard Collaborate Launcher. The maximum number of simultaneous talkers is 6. One of the attributes is that the session can be recorded. Google Hangouts is a useful tool that allows users to communicate with each other using video call. Other features include chat and screen sharing. Users can schedule a meeting using Google Calendar and Gmail. You will need to create a Google account and log in; a computer or phone with a camera and microphone (Learn how to use your camera and microphone when you start a video call for the first time); an an internet or data connection. From your phone install the application from the Itunes, Android or Chrome web store. You can use Hangouts to talk with multiple people at the same time. You can send messages in a group conversation with up to 150 people, or have a video call with up to 10 people. Skype is similar to Microsoft teams and can be used either via an application or online. Skype allows for individual and group calls through an online chat, video or audio. Telephone numbers can be called or contacts added by username. Skype allows for the sharing of documents and the feature of showing participants individual computer screens which can be useful to show others. Create a Skype account – this can be done using a personal email. Download the application onto your device or alternatively Skype can be accessed via an online web browser. Add contacts via username or email and get connecting! Up to 25 people can connect in a call. A good tool for group work, chats can be set up in Facebook messenger or a Facebook group can be created (either public or private) for greater variety of usage. A Facebook account is needed but it is not necessary to be friends. Features include: sharing photos, videos, polls and creation of plans. Participants need a Facebook account then someone will need to either set up a group or group chat. 150 people maximum (according to Facebook community). Google Communities is an online platform that allow for the sharing of information whether public or private. They allow for information to be shared, and likes and comments to be added expressing your opinions. This is a shared area to allow for a ‘community’ to be created between individuals. Participants require a Google+ account, from there you can create or search for communities of interest. Once a community has been created, it can be managed by the creator. This includes adding individuals, removing individuals, moderating posts and comments and editing the layout of the community. There is a limit of 30 people joining the community per day. Individuals who join the community can share posts or information, and comment and like other posts and comments. A discussion board known also as a discussion group, discussion forum, message board, is a space where users can leave and respond to messages. This could be in the form of a Q&A, a debate or conversation. Alternatively multimedia such as YouTube video could be added as a focus for questions and discussion. This will differ depending on the VLE used by your organisation. Examples of VLEs include Blackboard, Moodle, PebblePad and Canvas. LinkedIn groups enable virtual interaction in a professional environment without the need to be friends with the other participants. LinkedIn members with similar interests can link together and share business and career interests. The main feature is the ability to engage with other members without being connected with them directly. Participants require a LinkedIn account, and the group owner will have to set up the group for other members to contribute. The owner does not have to be connected to those who join the group. The group can have up to 20,000 members, according to the LinkedIn help page. Snapchat can be used as a group discussion via private groups. People are able to send snapchat photos and videos as well as images and videos from your phone camera roll. These can be edited with text and emojis etc. Text chat can also be sent in the group. Bitmojis can be used as an individual avatar. Private groups can now have their own story so people are able to post to the story for repetitive viewing. A very quick and easy method of group discussion but messages need to be saved or will disappear in 24 hours. Create a Snapchat account & create a new group. Add accounts through contacts, usernames or local accounts. Maximum number of people is 31 plus your own account. An application used to host video group discussions with the addition of text input. It can be used regardless of type of device (as long as you have a front camera and can download the application). Groups can be created and the ‘houseparty room’ can be locked so only the invited can enter. Houseparty room links can be shared. Create a Houseparty account & add contacts via link, numbers, username. Add friends to the room or create a group and call the group. Able to pause your video and look at other content on your mobile whilst still on chat through audio. Users can video chat with up to 8 people and are notified when a friend enters the app so you can decide if you want to join or not (without having to decline a call). WhatsApp Messenger is a free messaging app that uses your phone’s Internet connection 4G/3G/2G/EDGE or Wi-Fi, to let you message and call friends and family. WhatsApp allows users to send and receive messages, calls, photos, videos, documents, and Voice Messages. This a great tool to use for groups to actively engage and discuss using a variety of multimedia platforms to enhance the experience. To get started simply download the WhatsApp app from the Android, Itunes or Chrome Web Store, it uses your phone number so you don’t have to worry about pins or usernames. It also links with your existing address book allowing you to contact them via WhatsApp. Trello is a free online tool that enables participants to manage project tasks though collaborating on a planning board. Groups can engage together and create, update, move and delete task descriptions from different columns. The boards are kept private and participants can only view the boards they are invited to edit. Participants require a Trello account, and the owner of the Trello board adds new members using their email address so they can each contribute. Each Trello board can have unlimited members, and each account can belong to an unlimited number of group boards according to the Trello help page. Slack is an acronym for “Searchable Log of All Conversation and Knowledge”. The app allows you to create multiple channels that are either private or public and you can choose to add a purpose to let members know what the channel is about. There is also the option to send a private to direct message to between 2-9 people. This is useful for short conversations that don’t need a whole channel. First, visit slack.com/create to create a new Slack workspace. All you need is an email address that you can access. There are a few ways to give new people access to join a workspace: send them an invitation by email or allow them to signup using their email address. Rabbit is a free online streaming service, it allows you to share your screen with friends and colleagues from anywhere. Some of the features of Rabbit include: watching videos in-sync, video, voice and message chat’s and browsing the internet. Everyone who uses Rabbit requires an account, one individual creates a ‘room’ which they can add specific individuals (up to 25 people) or leave ‘open’ for anyone to access. Once this room has been created the link for the room can be shared though your Rabbit friend list, Facebook Messenger, Facebook, email or a simple link. When everyone is in the ‘room’ the video, audio and multimedia options can be used. Direct messages (DM) do not have the 240 character restriction, so can be used to have a detailed threaded conversation. There is an account limit of 1,000 Direct Messages sent per day. Once you reach this limit, you can’t send any more Direct Messages for the day. Within a direct message you can share links, add images, GIFs or emoji. Users need a Twitter account and to be connected. You can start a Group DM session on Twitter at any time by heading to the “Messages” tab. Click the “New Message” icon toward the top of your screen on web, or the speech bubble icon on mobile, and search for the names of people you’d like to add. You can give your group conversation a title. We hope this post has been useful and encourages you to try new ways to communicate and collaborate online. If you have additional spaces you recommend please share in the comments. The term ‘blogademia’ is cited by many as being coined by Saper (2006). Sadly however this paper is no longer accessible. 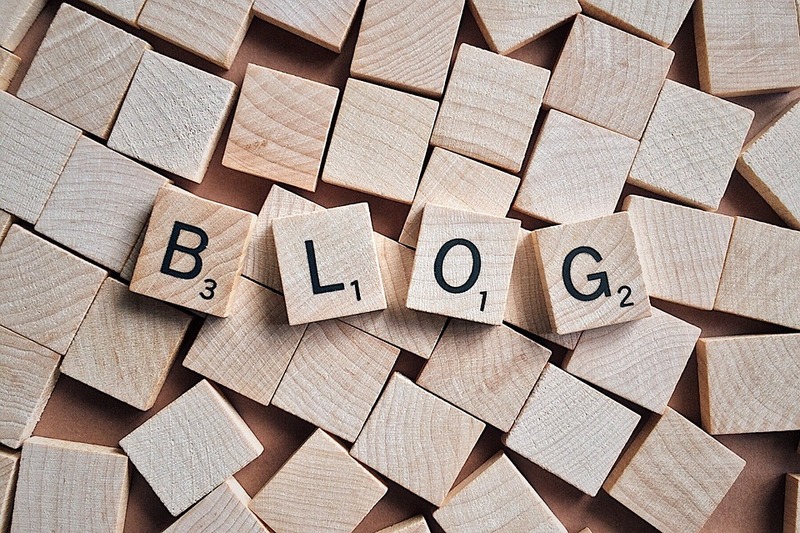 I came across it as I was researching this topic having been asked to give a short 15 minute introduction to blogging as a professional tool for academics at Anglia Ruskin University. The term seemed a fitting addition to this blog post. Why engage with blogs as a professional tool? One of the key benefits of creating a blog is that it is very easy to publish new content. Clearly if it is your own you have sole access. However it is becoming increasingly popular to ‘share’ a blog whereby multiple authors contribute to posts. A website that is owned by an organisation, for example a university, tends to have a more complex approach to adding new content – from a technical perspective but also because there are multiple gatekeepers and for good reasons protocols for format and design of content. A valuable alternative is therefore creating a blog. Many institutions now enable WordPress sites and these can be requested via IT services. The URL will include both the university URL and the title of the blog. 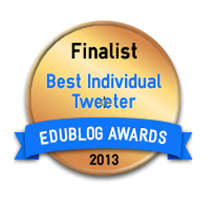 An example is below – The Social Media for Learning in Higher Education Conference blog. Finding something you are interested in and would like to write about is an obvious place to start. I’d recommend WordPress, but do explore other options such as Blogger, WordPress, Tumblr, Wix, Weebly, WikiSpaces or Google Sites. Other options include LinkedIn, Medium, Facebook. This needs to be succinct enough so that people will remember it, and also clearly indicate what the content is about. You can explore the options through WordPress, but there are also other ways to do this. As offers change over time I’d suggest you google this to get the best deal. WordPress offers over 100 different free themes to choose from. Assuming you are going to create a public blog and want people to read it, adding your details is a useful addition. Readers may want to discuss your posts and do this offline rather than through the comments. 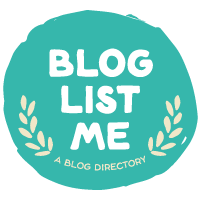 Below is just a small selection of blogs I’d recommend you explore both for content but also to see the different styles and approaches that can be taken. Arrebola, C. and Mollett, A. (2017) Introducing the Impact of LSE Blogs project. Saper, C. (2006). Blogademia. Reconstruction, 6(4), 1–15. Over the years I have engaged in a variety of learning opportunities which have included attending evening classes at local schools and then as a mature student at university. However attending classes in person is not always convenient for those with family commitments. When we think about alternatives to face to face learning it is fair to say that many of us may think first of all about the Open University. Established in 1969 it has provided many with the opportunity to learn at a distance and now online. Other universities also offer distance learning opportunities, alongside the traditional face to face offerings. Many began as correspondence courses where students were not physically present and posted text books and workbooks to complete and return. In the main these tend to be considered as formal learning, leading to qualifications on successful completion of coursework or exams. In recent years the development of affordable technology has given many access to online information and a thirst to learn in different ways. The use of social media has opened up opportunities for social learning, where individuals can interact and learn with and from others irrespective of location and time zones. This could be for formal credit or simply for pleasure. Technology supports both synchronous and asynchronous learning, which opens up flexibility and choice of when to learn. Audio podcasts allow learners to listen to recordings wherever they choose to, and many do this as they commute to or from work. Webinar technologies have enabled group verbal conversations to take place online, along with chat functions where users can type short messages to each other. Videos can provide helpful ways to learn visually and at your own pace with the ability to rewind and replay. Indeed through YouTube videos I learned how to mend my washing machine! As a result, there are now a multitude of online learning opportunities available, many of which are free. Choose from informal or formal, short or extended courses, and learn with others or independently. Develop or learn new skills, take up a new hobby or engage in a full online course. Below are a just a selection of some of the online courses now available. Chesscademy – Learn how to play chess for free. Craftsy – Includes baking, knitting, quilting and photography. Drawspace – Learn the basics if drawing. Pianu – An interactive way to learn piano online. Yousician – Your personal guitar tutor for the digital age. Babbel – Discover a new language experience. British Sign Language – Learn BSL at your own pace. Busuu – The free language learning community. Duolingo – Learn a language for free. Lingvist – Learn a language in 200 hours. Memrise – Use flashcards to learn vocabulary. Plain English – An opportunity to learn in plain English for crystal clear communication. Guides.co – Search the largest collection of online guides. Highbrow – Get bite-sized daily courses to your inbox. lynda.com – Learn technology, creative and business skills. Khan Academy – Access an extensive library of interactive content. Learnist – Learn from expertly curated web, print and video content. Squareknot – Browse step-by-step guides. United for Wildlife – Learn about the key issues in conservation. Alison – A wide range of free courses. edX - Take online courses from the world’s best universities. Coursera - Take the world’s best courses, online, for free. 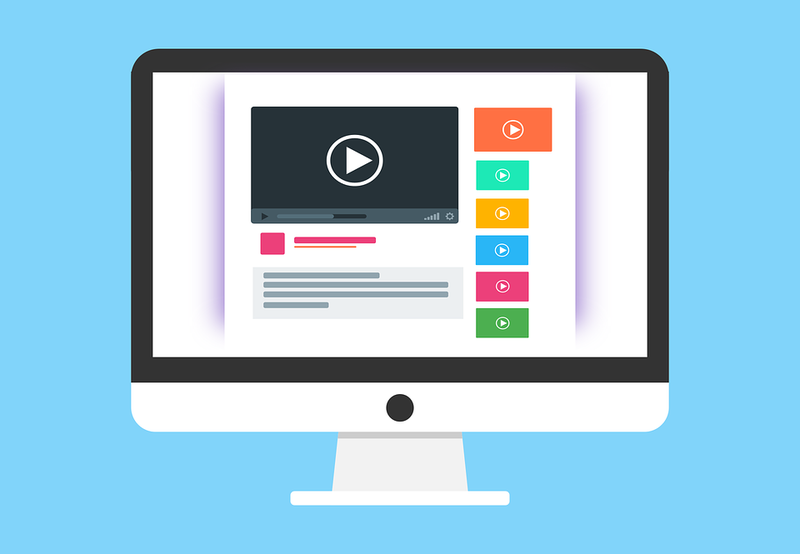 Curious – Grow your skills with online video lessons. CreativeLive – Take free creative classes from the world’s top experts. FutureLearn – Courses from universities and specialist organisations. OpenLearn – Offers a wide range of free courses. Skillshare – Online classes and projects that unlock your creativity. Udemy – Learn real world skills online. BaseRails – Master Ruby on Rails and other web technologies. Codecademy – Learn to code interactively, for free. Code.org – Start learning today with easy tutorials. CodeCombat – Learn computer science while playing a real game. Code School – Learn to code by doing. Dash – Learn to make awesome websites. DataCamp – Learn R, Python and access data science courses. DataMonkey – Develop your analytical skills in a simple, yet fun way. DataQuest – Learn data science in your browser. Free Code Camp – Learn to code and help nonprofits. One Month – Learn to code and build web applications in one month. Platzi – Live streaming classes on design, marketing and code. Thinkful – Advance your career with a 1-on-1 personal mentor. Treehouse – Learn HTML, CSS, iPhone apps and more. Udacity – Master in demand skills and earn a Nanodegree recognised by industry leaders. If you are a user of Twitter you can’t have escaped noticing the use of hashtags. People use these keywords preceded by # to add emphasis to what they are saying, but also use them to filter collections of tweets sharing the same conversations. Typically this includes organised chats and interactions at planned events and conferences. To capture all of the tweets sharing the same hashtag can be done easily by searching for the hashtag in the Twitter search box. What you may not know is that you can save this and other searches to come back to. Enter your search into the search box. At the top of your results page, click the more icon and then click Save this search. Next time you click the search box, a pop-up menu will display your Saved searches. At the top of your results page, tap the overflow icon and then tap Save. Next time you tap the search box, a pop-up menu will display your Saved searches. Note: You may have up to 25 saved searches per account. Click or tap anywhere in the search box at the top of the page. Find the saved search you’d like to remove listed below Saved searches (web) or Saved (Android), then click or tap on the X next to the search to remove. At the top of your search results, click the more icon and then select Embed this search. Follow the instructions to create a search widget that you can add to your website. Find more information in the developer documentation here. Google Keep has been on my mental list for some time but I hadn’t got around to using it until now. Why did I wait so long?! Keep can be downloaded as an iOS or Android app for use on your phone or tablet, accessed as a Chrome extension or via your browser. Add notes, lists, photos, and audio to Keep. Quickly capture what’s on your mind and share those thoughts with friends and family. Speak a voice memo on the go and have it automatically transcribed. Grab a photo of a poster, receipt or document and easily organize or find it later in search. Need to remember to pick up some groceries? Set a location-based reminder to pull up your grocery list right when you get to the store. Need to finish a to-do? Set a time-based reminder to make sure you never miss a thing. Next time you go to the store, share your shopping list on Keep and watch as items get checked off in real time. No need for text messages back and forth. Get things done together, faster. 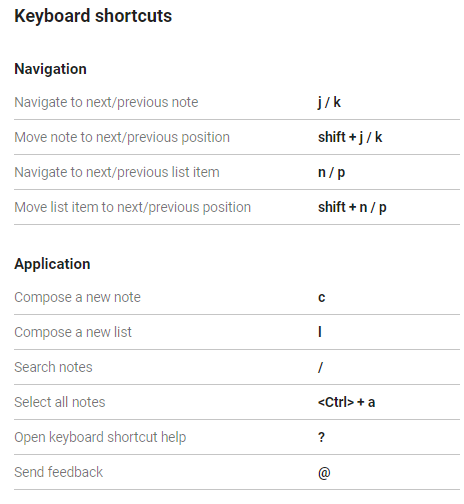 Quickly filter and search for notes by color and other attributes like lists with images, audio notes with reminders or just see shared notes. Find what you’re looking for even faster, and let Keep do the remembering for you. For further tips and support visit the Google Keep Help Centre. An effective communication plan is essential no matter how small or large the request, be this to create a new department Twitter account, a course promotion poster, a video of student work, a new blog to share teaching and research excellence/student achievements and learning gain, or a website to promote research. Whilst most universities will have a dedicated corporate communications/PR department, the role of communication extends much further. With the increasing use of open social media platforms, for example blogs and Twitter, it is wise to remind ourselves that no matter who the intended audience is, the information shared trough these channels can be found and read by anybody. Before we start to communicate to any audience it is therefore important to develop a clear plan. David Caveney from Comms2Point0 says that this process will help to clearly outline a concise and compelling need for the communication activity or campaign. He goes on to say that all sections of a communications plan should reference supporting evidence, formal, informal, quantitative and qualitative. 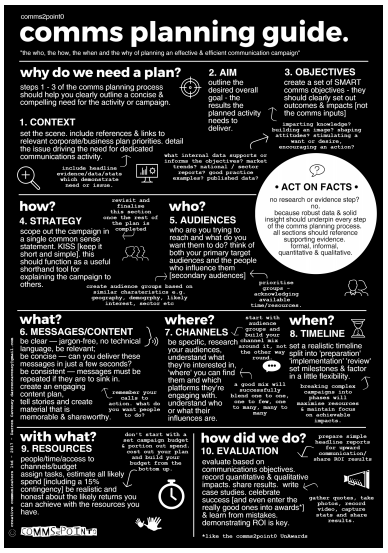 Comms2Point0 have generously shared this free download of a step by step guide to ‘the who, the how, the when and the why of planning an effective and efficient communication campaign’. The ten step plan below is a summary of this poster and presents valuable pointers and useful questions to help you through each of the 10 stages. Steps 1-3 of the comms planning process should help you clearly outline a concise and compelling need for the activity or campaign. These look at the importance of setting the context, outlining the aim and overall goal, and creating a set of smart objectives. 1. Context: Set the scene. Include references and links to relevant corporate/business plan priorities. Detail the issue driving the need for dedicated communications activity. Include headline evidence/data/stats which demonstrate need or issue. 2. Aim: Outline the desired overall goal – the results the planned activity needs to deliver. Are you imparting knowledge? building an image? shaping attitudes? stimulating a want or desire? or encouraging an action? 3. Objectives: Create a set of SMART (specific, measurable, agreed upon, realistic and time-based) comms objectives – they should clearly set out outcomes and impacts (not the comms inputs). What internal data supports or informs the objectives? Is it market trends? national/sector reports? good practice examples? or published data? 4. Strategy: Scope out the campaign in a single common sense campaign. Use the KISS approach – keep it short and simple. This should function as a useful shorthand tool for explaining the campaign to others. Revisit and finalise this section once the rest of the plan is completed. 5. Audiences: Who are you trying to reach and what do you want them to do? Think of both your primary target audiences and the people who influence them (secondary audiences). Prioritise groups – acknowledging available time/resources. 6. Message/content: Be clear – jargon-free, no technical language, be relevant. 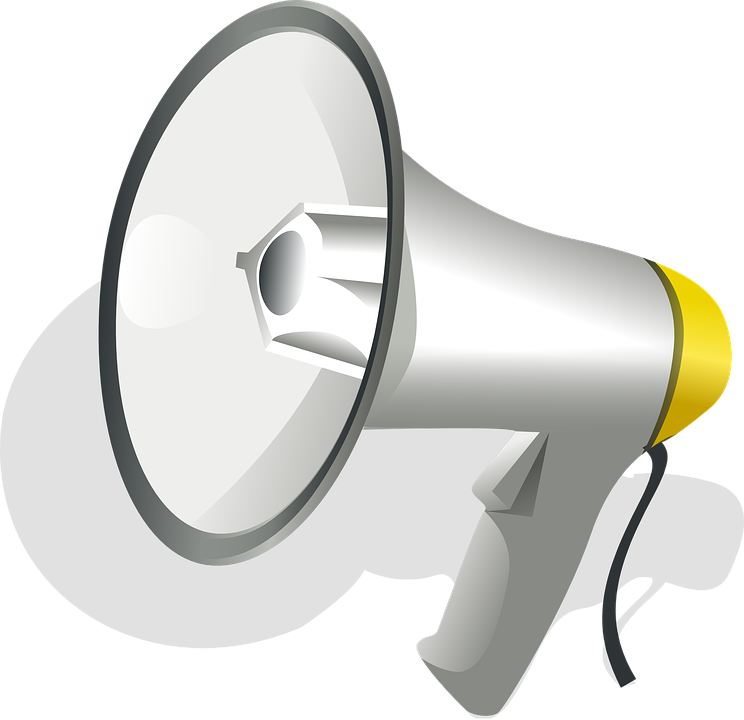 Be concise – can you deliver these messages in just a few seconds? Be consistent – messages must be repeated if they are to sink in. Create an engaging content plan, tell stories and create material that is memorable and shareworthy. Remember you calls to action. What do you want people to do? 7. Channels: Be specific, research your audiences, understand what they’re interested in, ‘where’ you can find them and which platforms they’re engaging with. Understand who or what their influences are. Start with audience groups and build your channel mix around it, not the other way round. A good mix will successfully blend one to one, one to few, and many to many. 8. Timeline: Set a realistic timeline split into ‘preparation’, ‘implementation’ and ‘review’. Set milestones and factor in a little flexibility. Breaking complex campaigns into phases will maximise resources and maintain focus on achievable impacts. 9. Resources: These include people/time/budget. Assign tasks, estimate all likely spend (including a 15% contingency). Be realistic and honest about the likely returns you can achieve with the resources you have. Don’t start with a set campaign budget and portion out spend. Cost out your plan and build your budget from the bottom up. 10. Evaluation: Evaluate based on communication objectives. Record quantitative and qualitative impacts. Share results. Write case studies. Celebrate success and learn from mistakes. Demonstrating return on investment (ROI) is key. Prepare simple headline reports for upward communication/share ROI results. Gather quotes, take photos, record video, capture state and share results. Are you using the right platform/medium? Are you providing the information your audience(s) want? Are you using the right tone in your comms? 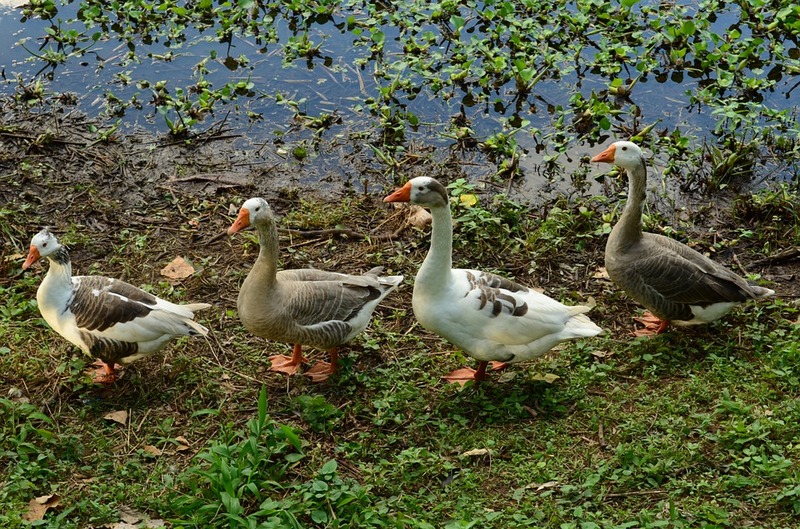 Are you giving your audience(s) a voice? 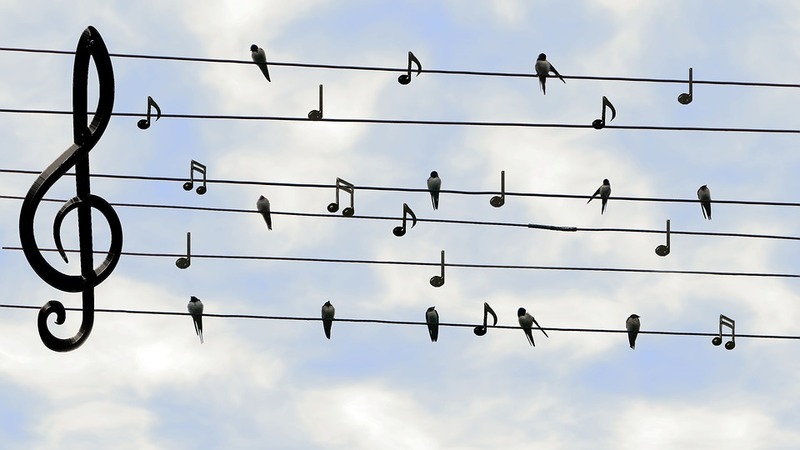 Are you listening to your audience(s) – what feedback are they giving? Product or service – what we are providing? Price – what we are asking for in return? Whilst these are important considerations, a communication strategy should go beyond marketing what your university offers. An essential part of a communication strategy is storytelling. With the wide range of communication channels including social media at our fingertips we can not only engage our audience(s) but invite them to contribute to a dialogue. If we want our audience to be part of the community then we need to find ways to include them in the conversations – communication as a dialogue rather than simply a monologue or broadcast. Caveney, D. (2017) Your essential new comms planning guide. Comms2Point0. McCarthy, E. J. (1964). Basic Marketing: A Managerial Approach. Richard D. Irwin: Homewood, IL. SMASH (Social Media for Academic Studies at Hallam) is a team of four IT with Business Studies students from Sheffield Hallam University looking to incorporate social media for the purposes of aiding higher education learning. Originally the team attended the SocMedHE16 conference at Sheffield Hallam University (having individually applied for one of 10 free student places). It was an interesting and exciting conference showcasing how lecturers and students alike were using social media to aid and develop their teaching/learning throughout higher education. Helping staff to identify and use social media tools for communication and collaboration within and beyond the classroom (Learning Activities). Helping students and staff to identify and use relevant social media tools to curate and organise information relating to learning (Organising Learning). Helping students to prepare digital portfolios to openly share outcomes and projects to develop a professional online presence (Showcasing Learning). First and foremost, learning activities. From the conference and also teaching in SHU it was clear that social media was being used in a variety of different ways to communicate with students in and out of lectures. Three key tools lecturer used for learning activities were: YouTube, WhatsApp and Socrative. Every student is different and each prefers to learn in their own way, i.e. visual learners, auditory and kinaesthetic etc. One such test can be taken here to assess the preference of learning style. Bearing this in mind it’s useful for lecturers to adapt their teaching styles in ways that would allow them meet all three types. Here’s where YouTube comes in handy. One lecturer used video scribe to create revision based videos which they then published on YouTube. This came handy for students looking to revise the material but in particular for visual learners. Often Lecturers and students communicate either verbally or via email. But one technique a Lecturer used was to communicate with their students through the ever popular tool WhatsApp. In particular this was useful to create groups for classes/modules and then allow the students to communicate with the lecturer via the groups set up. Although certain lecturers may feel that this may be too personal possibly, it did however allow for rapid communication between students and lecturers. Often lectures are a one sided push of information. However one technique used by a lecturer to make their class more interactive and to involve the students to participate was to use the Socrative application. This allowed for students to take part in polls related to class materials and vote during the lecture in which case the lecturer could provide feedback on the results to aid students learning. Social media tools can assist in the collaboration of learning, as both students and staff have multiple modules to organise and complete work and collect information on. When completing group-based projects in modules, it is often the case that students face issues to do with arranging suitable times to meet and to complete these activities. The three main applications, Google Docs, Google Slides and Google Sheets aim to solve this issue. By using these applications, tasks can be collaboratively fulfilled in real-time sessions, with further information about who has completed what work within the assignment, to aid peer feedback, and this can be used effectively by lecturers to record weekly task marks, and keep tabs on who has completed what in their students’ groups assignments. Pinterest, a more image oriented social media, can be used with the creation of ‘boards’ to define each module and learning topic being discussed, wherein a different board is used for different topics. Staff to student sharing of boards can be utilised with this site, to exchange useful links and sources and can be used to collect important information in one specified location which is crucial for revision. This is especially useful for more visual learners with the use of image based content. Significant posts can be taken from different social media sites, in order to create stories to organise learning into appropriate sections for effective learning. These posts can be found by hashtags to curate all this information shared with these tags into a story board. Narratives can be added with these story boards to aid learning underneath the playlist of storyboard videos. Why spend long amounts of time completing work and research projects if you aren’t able to share them with other academics and professionals? Social media platforms are key for enabling users to share their work amongst others’ in order to expand their own knowledge and their peers work. A professional networking site to build connections to other people working within similar industries and with similar interests to you. University projects can be uploaded including other people who have contributed and who you have collaborated with and your clients. Qualifications can be showcased, as well as academic achievements. This is a popular way to discover potential candidates for a position by HR departments within companies. Specified plugins and themes can be used to create web pages based on chosen topics. Blogs style articles can be written within these for reflection and showcasing learning. Links to other social media channels can be used to showcase other aspects of learning. Slideshow presentations can be uploaded from past conferences and learning conventions to enhance others’ learning, and curate resources for learning. Slideshare can be used by academics for lecture material and students for assignment research. 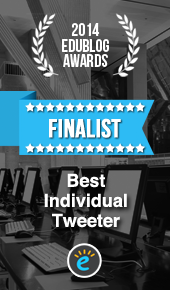 Users can post and interact with tweets from other users, including high-profile users. Twitter may be used to promote projects completed and showcase work and achievements completed, as well as acknowledge and share other users’ work and features include ‘pinning’ specific and current projects/events to the top of your Twitter profile. Below is an infographic summarising how social media can be used for learning. A playlist is a collection of videos that anyone can put together and choose to share with others. For example you could curate a playlist of your favourite music videos to play back to back. Increasingly people are using their mobile devices to access and watch short videos on the go, providing an abundance of micro learning opportunities. Whilst videos can be embedded within PowerPoint presentations it can also be helpful to include a link to specific playlists from your class VLE, blog or website to help users locate the collections more easily. Curated playlists could also help you organise videos by topic, to refer to at a later date. A playlist in YouTube is easy to put together (see the instructions further down) by selecting existing videos already uploaded to YouTube. However you may also want to consider creating your own videos and then making themed playlists. Below are some suggestions on how playlists can be used with your students, for your own professional development and also for sharing your research. During induction week ask students to record ‘about me’ videos and share as a class playlist – ask students to share their favourite food, music and hobby. Motivating music to use as students enter and/or during class when undertaking hands on tasks. A playlist of short video clips used in a lecture. A collection of ‘how to guides’ created as video screencasts. Using the ‘flipped approach’ ask your students to watch video clips in their own time and and provide a number of questions. The answers can be then discussed in class. Compile themed collections of TED talks or Khan Academy STEM tutorials. Another option is creating your own videos to share your research. A good example of this is Research Shorts which are short research video summaries by George Veletsianos and the Digital Learning and Social Media Research Group. These videos examine issues relevant to educational technology, digital learning, networked scholarship, and student/faculty experiences with technology and education. Start with a video you want in the playlist. Under the video, click Add to . Use the drop down box to select your playlist’s privacy setting. If it’s private, people cant’ find it when they search YouTube. You can find your new playlist from the Library in the Guide on the left side of the screen. Select a playlist from the Library in the Guide. Click the menu icon . If you’re sure you want to delete the playlist, click Yes, delete it. Note that your old playlist may live on in viewers’ watch histories.